Students from Deyi Secondary School in Ang Mo Kio took matters into their own hands over an alleged case of injustice. 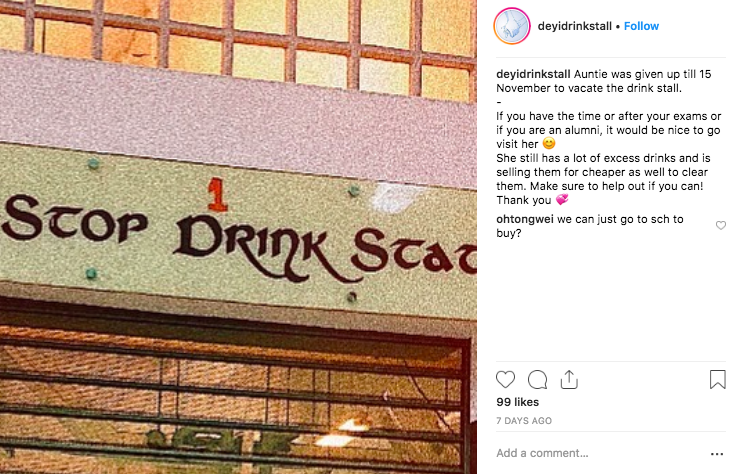 They alerted a media company via email on November 1 concerning what they felt was an unjust firing by the principal of a drink stall owner at the school. We need more of these students ! sugar addicts how to get their high? Good learn to stand for your rights and others ?? Trying to pull rank on an old lady, not surprise the next operator is one of the relatives of the principle. What a disgrace. Bravo students of Deyi. You have a heart….a loving heart for d less fortunate . Next let’s stand together to vote the government out. Hey, if helping the auntie doesn’t work out, get someone to check if the stall owner has some relationship to the school committee, there could be a FAMILEE style of tender process…. Perhaps, MOE or the School should make a clarification/statement before the matter gets blown out of proportion. We must be fair to the Principal too! This deserves to go viral yah? So pls share? Is the Principal or the panel an expert on cleanliness and can over-rule NEA’s grading or is NEA’s grading useless? I feel very sorry for the aunty. Salute to the students for standing up for the aunty. And shame on you Principal. Well done . Hopefully Shengwu can guide them in future to stand up to injustices on a larger scale. School principal maintaining KPI is more important. time for the Principal at Deyi to step down….!!! Principal can make judgement on hygiene better than NEA it seems. NEA and Masagos might as well closed shop?